OLADIPUPO ADESINA was born in Lagos State in the early 70's.He graduated with a National Diploma (General Art) and a Higher National Diploma (HND) in painting in 2013 from Lagos State Polytechnic, ikorodu,Lagos.He also won the overall best student in Art and Industrial Design in the same year. 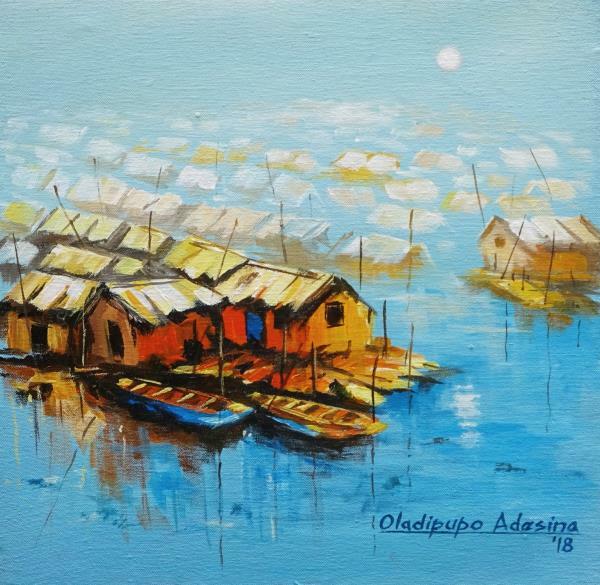 Oladipupo is a member of Society of Nigerian Artist (SNA).He has participated in several group exhibition within and outside Nigeria, some of his paintings can be seen in galleries like Nike Art Gallery, Mydrim Art Gallery, Terra Culture, Signature Art Gallery and Private Homes. He is presently a full time studio Artist,based in Lagos State. SELECTED EXHIBITION 2008 - Miniature Exhibition''Terra Culture, Victoria Island,Lagos. 2009 - Final Year Art Exhibition''Lagos State Polytechnic, Ikorodu 2013 - Repositioning Visual Art for better value at Reconnect Art Gallery,Lagos. 2013 - October Rain'' Nike Art Gallery, Lagos. 2015 - October Rain'' Nike Art Gallery, Lagos. 2016 - Affordable Art Show'' Mydrim Art Gallery. 2017 - Eko Art Expo'' at Eko Hotel. 2017 - Reel flick + Ansel Eddo, Art auction of modern and contemporary Art 2017'' Victoria Island, Lagos. 2018 - Serendipity''A Contemporary Art Exhibition, Lekki Phase One.